Further Documentation Of Inappropriate Behavoir By A Subset Of Members Of The CCSP 1.1 Committee And The NRC Review Committee | Climate Science: Roger Pielke Sr. The released e-mails provide a glimpse into inappropriate behavior by members of the CCSP 1.1 Committee and Phil Jones. 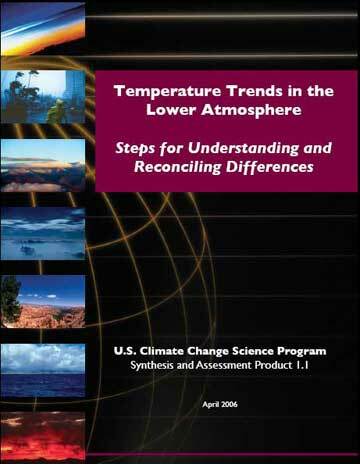 The CCSP 1.1 report Temperature Trends in the Lower Atmosphere: Steps for Understanding and Reconciling Differences was published in 2006. My view of that report was, and remains, that while there is useful and scientifically valuable information in it, it avoided discussing a number of substantive questions , including the robustness of the multi-decadal land surface temperature data of NCDC (Tom Karl), CRU (Phil Jones) and GISS (Jim Hansen). From my understanding on the committee, we were supposed to keep our discussions internal to the committee. Indeed Phil Jones writes in one of the e-mails ” I’m not supposed to talk to anyone of the report authors !” [the exclamation point was in the e-mail]. 3. The premature reporting of selected versions from the report to the media and policymakers prior to its actual finalization and public release. REDACTED Heard back from several sources about the Chicago meeting. Similar sentiments from Jim Hurrell. Email from Tom Peterson below and Jim’s bit pasted in below. It seems that not all was solved – re his last sentence about Pielke ! I just thought I’d send my CCSP trip report on to you too as it discusses the latest developments in MSU VTT matters that I’m sure you will be addressing in IPCC. Thanks for that. I was just about to get around to rewording that and sending it back. I had to read the first draft of the comments on the Executive Summary from one of the other panel members. Although there is a lot to do, I think you’ll like some of them. Many of the other chapter authors may not, though ! Maybe we’ll end up with some more dissenters ! A lot relate to Fu et al as you might have guessed. We have a conf call next Friday at 4pm my time, when hopefully we’ll get something towards closure on this. I’ve only had emails from two people on the panel and the secretary since I left Chicago. Unfortunately Mike Wallace doesn’t seem to have had time to look through Ch 5 (well very briefly). He was only on the conf call in Chicago for 30 minutes. He didn’t say much. that is in some models and not incorporated in others as >the forcing and its history is uncertain. NOTE WORDING — *NOT* A FORCING? >surface or tropospheric temperature record. ???? SAME THING TWICE ??? GOOD GRIEF — I HAVE RARELY READ ANYTHING SO POORLY WORDED!! , but it should be understandable. Tom K is also very fed up with Pielke ! about essential science indicators. I have 3, for 3 papers saying they’ve been heavily cited. The 3 are fromREDACTEDand have been cited 57, 68 and 41 times ! PER YEAR?? EVEN 68 TOTAL CITES IN 7 YEARS IS NOT MUCH. in 2001 and the one on error estimates from 1997. THanx Phil. Some comments in caps …. BEN WAS REALLY PISSED OFF WITH ROGER — AS WAS TOM KARL I GUESS (NOT YET TALKED TO HIM).ALL OF HIS POINTS CAN BE SHOT DOWN, BUT IT IS A PAIN NONE THE LESS. APPARENLTY JUDY CURRY EXPOSED HER INFERIORITY COMPLEX (ANS HER INFERIORITY). REDACTEDOff tomorrow and not back in CRU till March 10. I’m not supposed to talk to anyone of the report authors ! There was a lot of odd things said after the presentations in Chicago last week. We’re charged with writing a report, which will be published but you get to rewrite the report and no-one sees the one we looked at ! What is the point of publishing it ! REDACTED Roger Pielke didn’t come out of it too well. Some thought he had some good ideas but didn’t express them very well.Most thought he just didn’t express them very well. All thought Ben’s was the best chapter. Almost all think RSS is right. Also why is Fu et al. dismissed as controversial? A VERY GOOD POINT TO STRESS. THIS IS CHRISTY’S WORDING. ACTUALLY, IT IS. ALL ITEMS *ARE* IN THE CHAPTERS — BUT ONLY THOSE DEEMED MOST IMPORTANT (BY ALL EXCEPT ROGER!!) MAYBE I WILL HAVE TO DO ANOTHER (SIDE) VERSION THAT CITES THE SOURCES BY CHAPTER AND LINE NUMBER. so you’ll have to do some major reworking. REDACTED Remember I didn’t tell you all this. Lots of details to come – not sure when. Seems a long-winded process. COMMENTS DUE BY MAY 1, THEN WE HAVE 2 WEEKS TO MODIFY/RESPOND. Thus, while there are science issues discussed in these e-mails, it was an inappropriate interaction between members of the CCSP 1.1 committee and the NRC review panel. These exchanges occurred only with a subset of the CCSP 1.1. committee members.